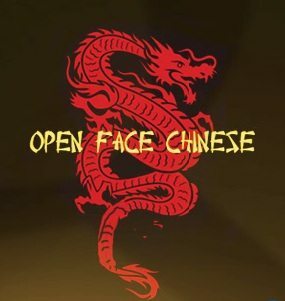 If you are new to OFC (Open-face Chinese poker), you might want to try out FTR’s OFC client (http://www.flopturnriver.com/ofc-poker) FTR offers OFC and POFC (Pineapple Open-Face Chinese Poker), which I personally find much more interesting than regular OFC. This client is browser-based and only has a play money games. However, no major online poker rooms spreads OFC, so finding play money games is your best bet at this point. If you are completely new to the game, you can start by reading FTR’s Ultimate OFC guide (http://www.flopturnriver.com/ofc-poker/ultimate-guide.php). You can play the bots or joining the Beginners tables, which are free to play, until you get the grasp of the game. There are two types of tables available – Open FTR Tables and Private Tables. Open FTR Tables are available to anyone, starting with free tables up to High Stakes tables, where you can play for 10 FTRP’s per point. You can choose between regular and turbo tables. Players’ time restriction per round varies between five minutes on a beginners table and two minutes on turbo tables. Private Tables have wider customization options. While Open FTR Tables are only available in heads-up format, you can create a Private Table for three or four players. Private Tables can also be password protected, which is a good thing if you want to create a table for a private game. You can also set your own time restriction and the number of rounds. When you open a table, in the top right corner you can see the “Lobby” button, as well as the button than turns the sounds on an off and the card mode button. There are two card modes, click-card mode and drag-card mode. If you are playing on a PC or a Mac, I would advise using the click-card mode. This means that you simply have to click on a card and then click on the target position to place it. This is much faster than the drag-card mode where you have to drag the cards to their position. However, if you are playing on a tablet or a smartphone, the drag-card mode seems like the better option. 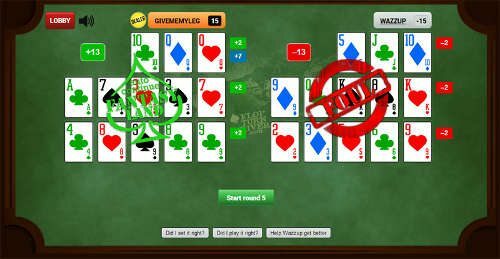 Overall, the OFC client runs surprisingly well on mobile devices and because it’s a browser-based client, there are no differences between the playing on a PC and playing on a mobile device. If you are lucky enough to hit Fantasy Land, you won’t have to waste time sorting our all your cards before you can put them in the best possible order. You can quickly sort all your cards by rank or suit, which will allow you to quickly estimate the best combinations you have going for you. FTR’s OFC client is relatively new, so while there aren’t tons of people playing, the traffic is definitely increasing. At this point, if you sit down at a table, you can probably expect to wait from five to ten minutes until someone sits down to play you. While you wait, you can always earn some extra points by crushing one of the bots. The easiest way to get FTR Points is to create a forum account and make your first post in the forums. This will get you 1,000 points each and with 2,000 points, you can comfortably play the low stakes tables. There are more ways to get FTR Points (http://www.flopturnriver.com/how-to-earn-ftr-points), but if you have a decent grasp of the game, the second best way after registering with FTR is simply playing the bots. While there are only Low Stakes bot tables available, currently it doesn’t take much to beat them. Even though they are pretty good at setting initial boards, they tend to make mistakes on later streets, so if you have a basic grasp of the game, the advantage you will have over the bots can get you a decent amount of FTR Points in a relatively short amount of time. FTR also has a nice feature that can help you work on your game. At the end of every hand, you will see two button at the bottom of the screen – “Did I set it right?” and “Did I play it right?” This is a very convenient way of uploading your initial setup or the complete hand to the FTR forums, where you can analyze it with the community. When you upload your hands using this feature, the client automatically fills in the code necessary for the hand to be properly displayed on the forum, so this feature saves you a lot of time. Overall, the OFC client is well designed and is very user-friendly. During the time I have been playing it, there were no glitches whatsoever. Moreover, recently FTR announced that players will be able to trade in FTR Points for FTR gear, like hats, T-shirts, hoodies, etc., as well as use them to buy-in to FTR freerolls and money-added tournaments, which sound pretty great! As the number of players grows, it would be nice to see higher stakes tables and possibly regular OFC tournaments added. Real money games probably won’t be available for a while, but if you and your friends want to play for some cash, you can always agree upon the stakes the play money tables. The Private Tables will provide everything else! Poker players also do surprisingly well at fantasy sports for real money. The biggest fantasy football winners were former online poker players! Learn more about fantasy football at Fantasy Footballer.org and you can read their Draftkings review at https://fantasyfootballers.org/draftkings-review/ and their Fanduel Review here to learn more about the two biggest fantasy sports sites on the Internet!